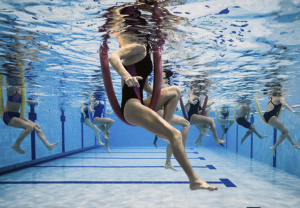 Aqua Cardio Core is a water-based cardiovascular workout that requires no swimming skill. Floatation dumbbells, noodles and kick boards allow participants to “run”, “ski” and “cycle” in between core sets. A more demanding program–Suit Camp–is occasionally offered. This class is typically offered at 1 p.m. when the pool at the Cape Elizabeth High School is not busy. Drop ins are welcome. You’ll get some instruction and ideas for your own independent water workout. You can work out on your own additional days of the week. If you are unable to walk well or run like the wind, this may allow you to rehab yourself. The participants vary from injured runners to hikers to people looking for an intense workout that won’t hurt their joints. Register through Cape Elizabeth Community Services.